A decent chronological info dump, but fails to get under the icon’s skin. Feels largely indistinguishable from a number of other prestige movie biographies. The man in the red beanie hat, Jacques Cousteau, is the subject of this plush, polite and very unofficial biography from French director Jérôme Salle. Playing like a big budget TV movie, The Odyssey chronicles a large segment of Cousteau’s life starting with the birth and ending with the death of his son, Philippe, played by Pierre Niney. Fans of the iconic oceanographer’s pioneering work would likely do best seeking out his excellent nature and ecological documentary features and TV specials, as this is essentially an elongated, CG-powered Wikipedia entry with the odd melodramatic insert. 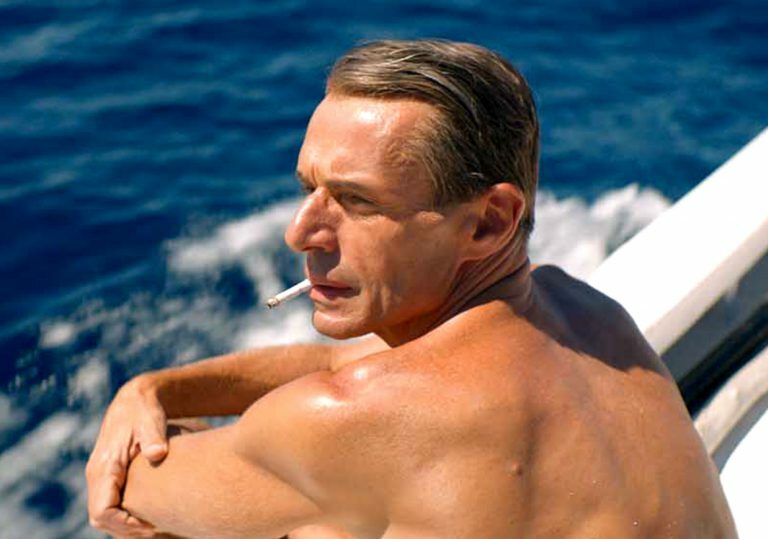 Things start well, with Lambert Wilson’s decorated naval officer – surrounded by his loving family – deciding that he wants to pack it all in and live a life out there on the briny. Audrey Tatou plays his long-suffering wife, Simone, who starts of as the brains of the outfit, but soon succumbs to the loneliness of an existence as the sole female on creaky research vessel, Calypso. The film initially makes it appear as if the pressure placed on this star-crossed pairing will augur the human drama, but very quickly, Simone is swept to the side as the story narrows its focus on Jacques’ various mad-eyed business endeavours. There’s a lovely early scene of the family taking a sub-aquatic plunge into an underwater cove to observe the exotic sea life. Salle cuts through a sense of otherworldly wonder with a dash of danger – hinting that this line of work is not without its hazards, even if it pays major experiential dividends. Shafts of light press through the waterline like a spotlight and small fish weave in between them and then descend into the shadows. The idea of sharing this secret spot – unsullied by human hands – is what drives Jacques to embrace the life of an all-or-nothing marine educator. But by the point of the half-way mark, the film fall to pieces, compressing time and events into a hurried montages and doing away with any of the character work from the early stages. Though you end up believing that Salle and his co-writer Laurent Turner believe that, despite his flaws as a father, Cousteau was ultimately a good man who dreamed too big for the moment in which he was living. The film falls foul of many biopic common, the main one being that you just can’t compress the life of a person into a feature-length runtime, however hard you try.